STAR TREK / DOCTOR WHO - Assimilation | Warped Factor - Words in the Key of Geek. 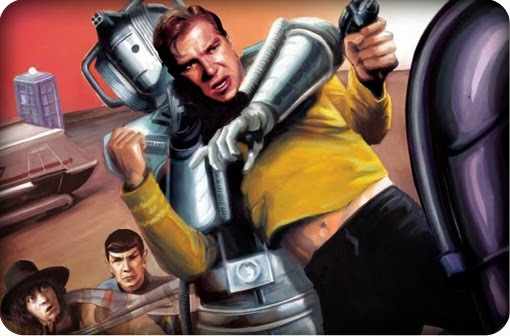 Christopher Morley looks at the comic book crossover event featuring the Doctor and the crew of the USS Enterprise NCC-1701. Two maverick captains & indeed their iconic vessels- the Fourth Doctor in command of the TARDIS while one James Tiberius Kirk took all the big decisions aboard the Starship Enterprise- finally met in the comic-book crossover Assimilation, as the Borg & the Cybermen forged an alliance in a mutual bid to upgrade the galaxy to their way of thinking. Flashbacks to Revenge Of The Cybermen abound during the segment in which the man who's all teeth & curls takes the lead! Stardate 3368.5 to be exact. Having worked out that something's not right during their investigations into a Federation archaeological survey on Aprilia III, Kirk takes his dream team of Spock, Scotty & Dr McCoy to assist in getting to the bottom of things. In doing so they make a valuable ally in the form of a certain scarf-wearer who's able to help them work out what's wrong with the survey team. 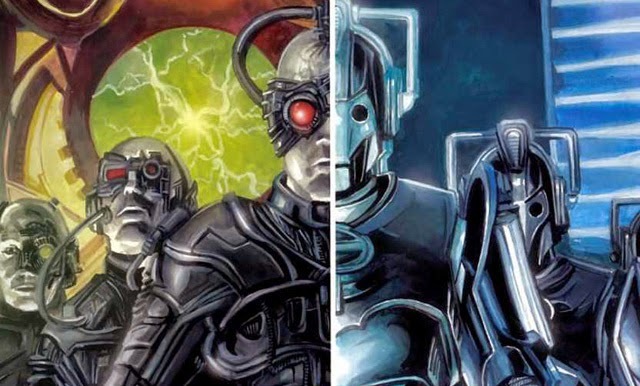 They're in thrall to the Cybermen, the earpieces in their lugholes proving the giveaway! Of course, they wouldn't have been able to get even that far without a little help from the sonic screwdriver in breaking an electronic lock. 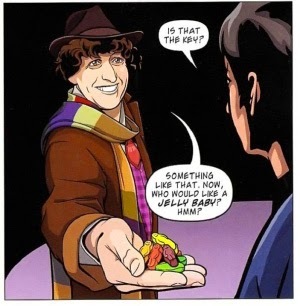 Quite an introduction to the man they'll come to know as the Doctor, who of course offers everyone a jelly baby. And how are the Cybermen ( led by a black-helmeted Cyber-Leader) who interrupt the effort to rescue the archaeologists defeated? Gold proves their undoing, just as it did on Voga. 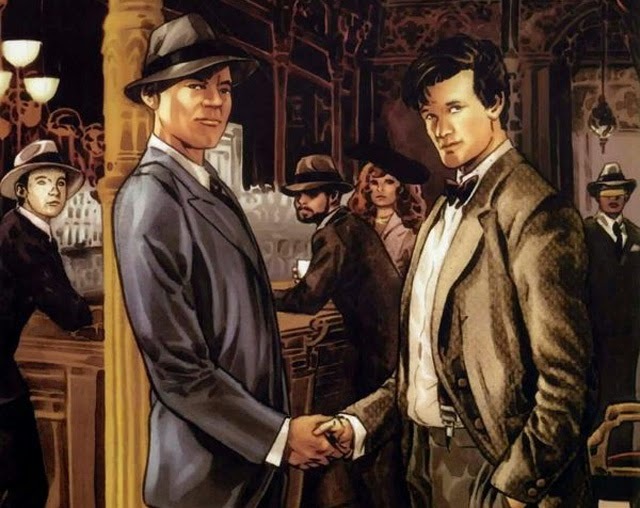 The eagle-eyed amongst you might also spot signs for 4th Street & Tom's Bakery as part of the Enterprise's simulation of the San Francisco of the 1940s- which is where the Eleventh Doctor enters proceedings with Amy & Rory. The memory of his earlier incarnation's meeting with Kirk, during which he was without a companion- placing it either somewhere between The Deadly Assassin & The Face Of Evil, during which he gains Leela- is spurred by a data log of the incident. For the crew of the Enterprise, it comes at a point between Operation-Annihilate & Amok Time. 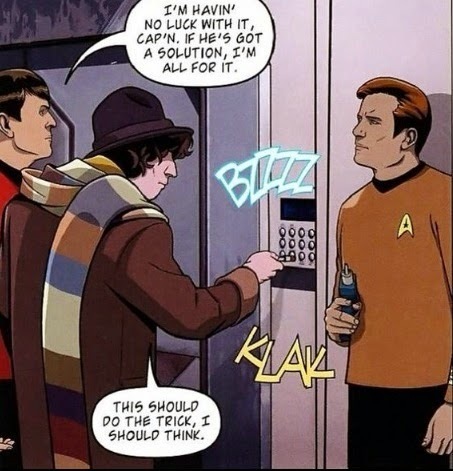 In what could be seen as a nod to Pyramids Of Mars, the Eleventh Doctor shows Kirk's successor Jean-Luc Picard the consequences of a future in which the Cybermen have succeeded in conquering the universe, just as his earlier self did to persuade Sarah-Jane Smith that Sutekh cannot be allowed to escape his pyramid prison! A ship's captain favouring a woodwind instrument? Now then, where have we seen that before? Perhaps one day an Assimilation prequel can facilitate a duet between Jean-Luc & the Second Doctor- we can but hope! For Picard & his crew, their meeting with the ''mad man with a box'' is placed between The Outcast & Cause And Effect. From the Doctor's point of view, his return visit to the Enterprise can be said to fall anywhere between the festive special A Christmas Carol & The God Complex. Is there a marked difference between writing for Who & Trek? "We've said before that "Doctor Who" tends to be more "science-fantasy" as compared to "Star Trek's" "science fiction." I think by the nature of the story, with the Doctor and the Ponds coming aboard the Enterprise, it might have tilted a little bit more toward the Trek side, but we always tried very hard to keep it as balanced as possible. We tried to strike a balance for purposes of the crossover. I wouldn't really say that it leans more one way than the other." "I think both share a single attribute that sets them apart from so much other dystopic science fiction:hope. "Star Trek" is all about hope, in the belief in a future without war, without poverty, without ignorance or greed. And in "Doctor Who" you have a protagonist who never loses hope, and whose companions never lose hope in him. And like I've said before, hope is the best reason to keep tuning in week after week." Who were the most fun protagonists to write for? "The Doctor was the most fun to write, while coming back to Picard after being away for a while was like putting on a pair of comfortable shoes. 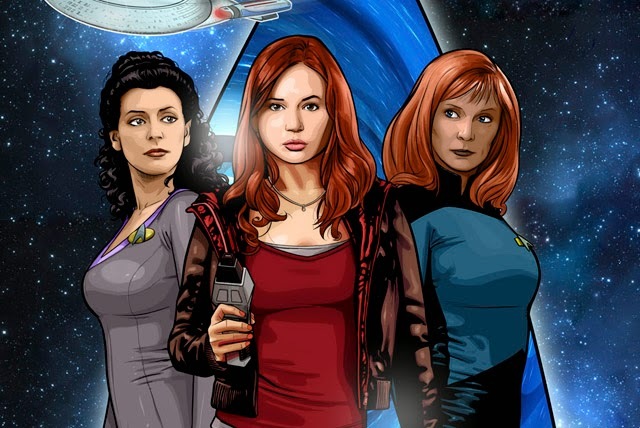 I also really liked writing some of the unexpected relationships like Amy and Dr. Crusher, or Rory and Worf." Fans of both loved it, too! Long may the TARDIS & Starship Enterprise continue to fly side by side, we say!